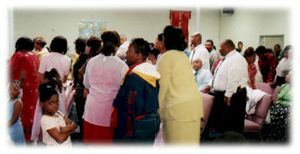 The Church On The Way Praise Center is a new testament church born of God out of a prayer meeting. We are a prophetic, missions minded church moving in apostolic authority. This church came forth October 23, 1982 and signs of God's presence have been manifested since the beginning. Many people attest to life-changing experiences being their portion as they have attended... The Church On The Way Praise Center. The presence of God is always evident and His presence is ushered in through intense praise and worship offered up to Father God. Our greatest desire is to "fully occupy till He comes." Come and let us go up in the presence of the Lord together. Let us worship and bow down before the Lord our maker. The Church On The Way Praise Center is pastored by Carolyn Cox.